A day after signing Martellus Bennett, Packers GM Ted Thompson struck again at tight end by adding Milwaukee native Lance Kendricks. Growing up in Milwaukee, Lance Kendricks bled green and gold. “I definitely grew up a Packers fan, so it was fun to see them win the Super Bowl,” Kendricks said at the 2011 Scouting Combine. Now, he’ll play for his childhood team. Green Bay Packers general manager Ted Thompson struck again, adding the veteran tight end on Saturday. A day earlier, he pulled the stunning tight end switcheroo by yanking an offer from Jared Cook and signing Martellus Bennett. According to agent Neil Cornrich, there was "significant" interest around the league in the former Wisconsin standout but Green Bay was Kendricks' first choice. "It's a dream come true" for Kendricks, Cornrich said. Kendricks and Cook were teammates with the Rams from 2013 through 2015. 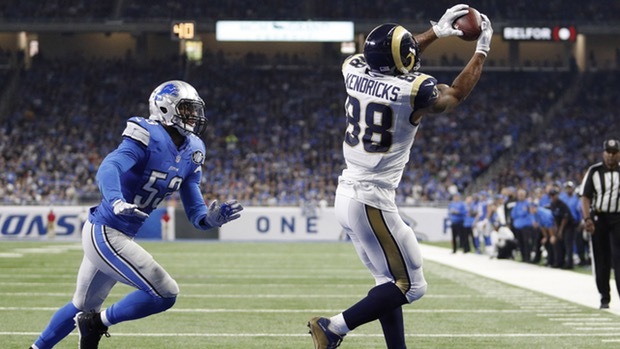 With Cook in Green Bay last year, Kendricks flourished in a full-time role with a career-high 50 catches. He turned those into 499 yards (10.0-yard average) and two touchdowns. That was with rookie Jared Goff. Now, he’ll play with Aaron Rodgers — with whom he's worked out with and caught passes from at Proactive Sports in Westlake Village, Calif.
"He really loved that opportunity," Cornrich said. Kendricks watched plenty of Rodgers on video while with the Rams. Kendricks caught about 70 percent of targeted passes in 2013 and 2014 but fell to 62.5 percent in 2015 and 57.5 percent in 2016. He also had a career-high six drops this past season, according to STATS. However, Kendricks will fit well in Green Bay's offense because he not only has experience as a traditional tight end, but split out like a receiver and in the backfield as a fullback. The 6-foot-3, 250-pound Kendricks, who turned 29 in January, signed a four-year, $18.5 million contract in 2015 but was released on Thursday. He was due $4.25 million in base salary and roster bonuses in 2017 and 2018. When he was released, Russ Ball, the Packers' vice president of football administration and team cap guru, quickly reached out, Cornrich said. Unlike Bennett, Kendricks won’t impact the compensatory-picks ledger because he officially was a street free agent. The Packers are loaded at tight end with Bennett, Kendricks and Richard Rodgers. They combined for 135 receptions (55 by Bennett, 50 by Kendricks, 30 by Rodgers) and 1,471 yards (701 for Bennett, 499 for Kendricks and 271 for Rodgers) in 2016. That, of course, is assuming Rodgers remains in the picture. After the 2016 season, he received the “proven performance escalator,” which goes to third- through seventh-round draft picks who meet playing time thresholds. That meant Rodgers’ base salary went from $690,000 to $1.787 million and his cap number went from about $826,500 to $1.924 million. Beau Sandland, an undrafted rookie last year, is the only other tight end on the roster. Looking ahead, this is considered the best tight end draft class in years. As many as eight could go in the first three rounds, a scout said. A combined seven were selected in the first three rounds the past two years. Back to Kendricks, he's caught 204 passes for 2,132 yards (10.5) and 17 touchdowns since being a second-round pick in 2011. At the 2011 Scouting Combine, Kendricks ran his 40 in 4.75 seconds with a 34.5-inch vertical leap.